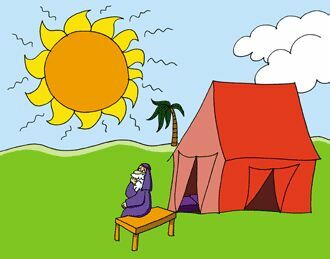 The Gemara (Bava Metzia:86) tells us that Hashem revealed the full extent of the sun’s heat in order that it be so hot that Avraham would not be burdened with guests. It is then difficult to understand why Avraham felt so dejected at his inability to perform the Mitzva of “hachnasat orchim”. Since there were no needy passersby due to the heat, he was not expected to create them! If the purpose of tzedaka is merely to help the poor, and there are none around, then there is no obligation to give. So why as Chazal explain, was Avraham so distraught? Chazal are teaching us a most profound lesson: the purpose of giving, doing chessed in general, and tzedaka in particular, is not a one way deal, solely to benefit the receiver. It is mainly and primarily geared and focused on the benefit to the giver. Acts of kindness lead to the cleansing, purifying and tikun of one’s own Neshama. As the giver refines and improves himself by lovingly embracing and helping someone in need, the giver becomes sensitized to the pain of others, while simultaneously reducing his selfishness and egotism. It is a win-win situation, This is precisely what Avraham is so disappointed about. Despite Avraham’s objective inability to help the needy, he felt tremendous sadness at the loss of opportunities to polish his soul with deeds of giving that would have the ultimate boomerang effect of building his own stellar character to the greatest heights possible. As Shakespeare so aptly said: “The more I give to thee, the more I have.” (Romeo to Juliet) This is why the Torah describes Avraham’s actions in such great detail when the “guests” finally do come. (Breishit 18:2-8) Self-transformation occurs in stages, with great attention to each detail of catering to his unfamiliar visitors. We ought to be cognizant of the fact that dating and marriage provide us with infinite opportunities to better ourselves by giving without expectations of a quid pro quo. (Naturally, in a good relationship, the expression of appreciation is vital.) We need to realize that giving brings out the best in us and adds new dimensions to our character, while the receiver may be assisted as well. This modus operandi is not always simple. We used to live in a world of krep-lach, ruge-lach….it’s for YOU! Today the most popular Israeli snack is bis-li: for ME! We live in a world of take take take! Shlomo Hamelech teaches: “olam chessed Yibaneh”. The world is based on chessed. Avraham, who is the paradigm of chessed, taught us that we are each an entire world and we change ourselves and the world for the better when we realize that the purpose of giving in not only to lend a hand to another, (which Hashem is obviously capable of doing on His own,) but rather to refine and purify ourselves, to transform ourselves into the holy beings which Hashem intended us to be and reach the level of truly living in His image. Sherrie B. Miller is a Jewish matchmaker on SawYouAtSinai and a dating coach in Jerusalem. She received her counseling degree from the Michlala in Jerusalem and an M.A. in Jewish Education from Touro College. Sherrie is certified by Midreshet Emunah and is accredited by the Rabbanut of Israel, to be a pre-marital couple’s counselor and Kallah teacher. This Jewish Dating Column is brought to you by SawYouAtSinai, the Jewish Matchmaking service. Articles are often written by Jewish matchmakers, to help Jewish singles connect. TU B’AV: THE JEWISH VALENTINE’S DAY! PARSHAT BALAK: UNITE OR UNTIE: IT ALL DEPENDS ON THE "I" (EYE)! PARSHAT CHUKAT: CONTROL ANGER BEFORE IT CONTROLS YOU! PARSHAT KORACH: "IF YOU SPOT IT, YOU GOT IT!" SHAVUOT: "NA'ASSE V’NISHMA” COMMITMENT COMES FIRST!